On the morning of our wedding my alarm clock rang at six. The night before I brought all my bride beauty essentials to my parents’ house, into my old room where I used to sleep with my sister Claudia what look like decades ago. Only a dozen yards from my house, same address, same view, same garden and same air, yet it seemed like a lifetime ago. At six my eyes were already wide open. I got up silently, not to wake up Claudia who was still sleeping next to me, and went downstairs to have breakfast with mum. She is always the first one to get up, and she had already made coffee in the moka, a crostata and a yogurt cake. You have to be ready to welcome not only a hairdresser and the make-up artist, but also all the friends who would stop by to visit us before the ceremony. A silent and quiet coffee, as if it were a common mum and daughter morning, then suddenly a merry-go-round of people, hugs and kisses began, and it would stop only late at night. Chiara and Giulia, two friends who took care of the hairstyle and make-up, were the first to arrive, transforming my parents’ living room in a beauty salon. Shortly after, Claudia, my sister, and the other Claudia, Tommaso’s cousin, our two efficient and precious witnesses, came downstairs, then gradually Regula, Sarka, Laura, Valeria, Anna and Lauretta appeared on the door. Mum was playing the hostess, distributing coffees and slices of cakes, grandma was standing on one side, soaking in all the emotions, already dressed in her new elegant tailleur, with a pink dressing gown over it, so as not to get dirty. In all this, Noa was missing, as she had slept with Tommaso the night before. She came in shortly thereafter, sneaking in from the kitchen door, wagging her tail, leaving white hair on everyone, all excited as if she could feel that this was an important day for all of us. She was hiding a handwritten note inside her collar, a way of Tommaso to get communications through enemy lines. This is when I started to get emotional and I didn’t stop until the end of the day. I was feeling like the main character of one of those movies that contributed to my sentimental education, those comedies where you already know how it will gloriously end. I often think back to those hours, but I have a clouded vision, sometimes for the tears of emotion, others for the makeup, hairspray and the early wake up. At ten, everyone disappeared as Cinderella when the clock strikes midnight. Now it was just me, my dad, who would also drive me to the church, and Noa, as she would spend part of the day at home, joining us just in the late morning. Andrea, our friend and photographer of the day, made me promise not to move until he would call me, as he needed some time with the groom to take more pictures: after all, the church was just five minutes from home, I just had to be patient. I placed the bouquet on the old well in the garden and began walking back and forth, greeting the neighbours who would wave at me from their windows, spasmodically controlling the veil and the braid, with my dad impatient to leave, to walk me down the aisle. A very short walk, given the dimensions of the Mensanello country church. When Andrea’s go arrived, I kissed Noa goodbye, I took a big breath and ran into the car trying to squeeze my dress into a Fiat 500. Then we left. The Fiat 500 Abarth that my uncle lent us for the wedding quickly covered the few turns that separate us from the church. When my dad parked just next to the church, I was flooded by the smiling faces of friends and relatives, applauses, a blinding sun, greetings shouted from afar, friendly and reassuring looks, the arm of my father to cling to, the veil to fix, the pebbles I was trying to avoid not to stumble with my heels, and a free hand that in my countless mental rehearsals of that day was not there. Was I doing something wrong? The bouquet! I left the bouquet at home! I started shouting to my friends. I had left the bouquet on the well, among my grandma’s succulents. Panic was spreading through the guests, already acquainted to the hysteria scenes of modern brides. I started laughing, though. There is always something that goes wrong with a wedding, so it could be the bouquet, even if I had chosen it months before and I had bought it on Etsy along with flowers for my hair, for Noa’s collar, for our witnesses and for the groom and dads’ boutonnieres. I was ready to walk the aisle without a bouquet. Suddenly Sara, one of my almost-nieces, emerged from the church, brandishing a bouquet. She was radiant. Why was there an extra bouquet? My aunt had given her a spare bouquet so that she could have a role too, as her sister was in charge of the wedding rings. But nobody had imagined such a triumphal entry. Sara had the smile of someone who had just saved a wedding in front of more than a hundred guests. She did not walk, she was flying. I grabbed the bouquet, I took my dad’s arm and we entered the church on the notes of the Ave Maria, sung by our friend Valentina. Tommaso was there, excited and emotional, he looked at me, took my hand and he never left it. Exactly four months have passed since that day. Every so often I look at the photos of that day to be sure that it really happened, it was not just in my imagination. I wore a ’50s style white dress with a short veil, we got married in the church of Mensanello, we made it despite the ever-growing to-do-lists, the work deadlines, the unexpected. We wanted a wedding that looked like us, simple, warm, ours. It required more effort and commitment than we had anticipated, but we made it thanks to the help of many friends, who made this day even more special. For weeks, we surfed the emotions of the day, entitled to celebrate it and celebrate us. Today, after four months, now that the rhythms of life and work are normal again, it is time to start celebrating again. As I promised you a few months ago, here are some pictures and some more details on the menu, location and, above all, on the wedding cake! Mensanello is an agriturismo and a working Tuscan farm. We use their wine and their extra virgin olive oil during our cooking classes and we open their beer when we bake pizza in our wood burning oven. We are friends. We consider ourselves lucky to be able to grow together in this lesser known part of Tuscany, supporting each other and meeting over a good meal, uncapping a bottle of beer, as this is when the best ideas show up. Tommaso mentioned the idea of actually getting married there after we celebrated the wedding of our friends Marta and Conrado in Mensanello. It took me a while to realise that this was an actual proposal, but Mensanello was immediately included in the wedding planning. Besides this, the church where we wanted to get married was right there, in front of the farm. We liked the idea of arriving and staying in one place, within a village, so that it would be a real country wedding. Since we liked the idea of a home-made wedding, we had to take care also of our decorations. We collected jars and bottles throughout summer, we bought candles and candlesticks, we chose flowers at the market the morning before the wedding and about 50 pots of fresh herbs at the Cooperativa di Legnaia in Florence. It took us a visit to Luisa at Il Rigo and a quick session of DIY decoration theory and practice, plus an idea of centrepiece scribbled on a yellow paper placemat, to empower us to deal with this aspect of the wedding, too. The afternoon before the wedding, our two irreplaceable Claudia collected rosemary, lemon verbena and pineapple sage in the garden, plus some spontaneous flowers around Mensanello. They composed the flowers and the green sprigs into jars and bottles that would go along with candles and herbs to decorate all the tables. On the tables, white tablecloths and jute runners. We finished all the preparations the night before at ten, we had dinner there at Mensanello with some friends and we came back home. We kissed goodbye. We would see each other again the next morning, in the church. Regula and Bruno designed our wedding invitations based on the watercolour flowers painted by Tommaso’s mum. They also prepared meters and meters of buntings to decorate the Mensanello veranda where we would have the wedding reception. Regula, Bruno, Sarka and Francesca turned a country veranda into a wedding hall suited for a country English wedding. As for the wedding favours, we kept the botanical theme. We chose tiny succulents at the Giardino Sotto Vico, a botanical garden that has a wonderful collection of succulents from all over the world, which is also an educational, therapeutic, meeting and leisure centre for children, adults, elderly people, disabled people and schools. This space provides a welcoming and comfortable place where people can meet and where the appreciation of the personal creative spirit overcomes individual differences, through freedom of expression. A few days before the wedding we went to Radicondoli to visit our friends at Podere Paugnano. It was Wednesday night, just before dinner time. The road through the woods and through the sun-burnt fields was empty, the car windows open, the light oblique and red, as in the late summer sunsets. Usually Tommaso and I are silent in the car, but that day we were tracing for the umpteenth time all the things had still to do: the flowers, the herbs, the menus to be printed. We spent September in a perennial state of checklists. As soon as we arrived in Paugnano, though, a magical feeling of calm embraced us. From the farm you can see the medieval town of Radicondoli, perched on a hilltop, and then only valleys, woods and fields. The tinkling of the sheep bells is one of the few sounds that one can hear, along with the distant bleating of the flock and the cats’ meowing, that run to you as soon as you get out of the car. Immediately after the cats, Giovanna with her smile and her hug. I met Giovanni and his wife Giovanna by chance, but since then I have learned to appreciate all their cheeses, the young and the aged pecorino cheese, the fresh ricotta, the robiola and my favourite, the milky raveggiolo. They produce their cheese daily, both with animal and vegetable rennet, the ancient one, the first that man has discovered, obtained from the wild thistle, the cinaria cardunculus called presura in Tuscany. Giovanni’s family came in 1969 from Barbagia, in Sardinia, at the beginning they just produced milk to sell it to local dairies, then they slowly began to produce their own cheese. They are the only farm in Tuscany to produce the pecorino di Lucardo, an ancient cheese mentioned in Boccaccio’s tales. It is made with vegetable rennet obtained from the pressura infusion, it requires a complex process and a long maturing in cloth bags made of a mixture of flax and hemp. It is a compact savory cheese; after a long maturing it is vaguely reminiscent of Parmesan cheese. It was so precious that it was even used as trading currency. We opted for this cheese for our wedding, alone with a fresh pecorino, an aged pecorino and a robiola. We served the Paugnano sheep cheese with a selection of honey and jams. There were a few jars of local raw honey that Marta and Conrado, two of our dearest friends, gave us. It is so precious for us as we’re sure their bees reached also our blooming acacia trees. We had also onion jam, now a classic during our cooking classes, and spicy tomato jam, something I made for the first time this summer. Before grasping the amount of organisation, lists and time putting together a wedding requires, I thought I wanted to cook for my own wedding reception. Yes, I would certainly have enjoyed it, and I could see myself bringing a tray of lasagna with a grease stained apron tied over the wedding dress. But when we started thinking about actually getting married in Mensanello, I realised that not having to cook but being able to follow closely the menu, the choice of ingredients and being able to contribute somehow to the final result was the best solution not to get mad. Luckily for once I was reasonable. We wanted home-made pasta, we wanted ravioli. So we decided to make them, with the fresh sheep ricotta from Paugnano. The night before the wedding we knocked on the kitchen door in Mensanello, showing up with a dozen bags of ravioli, prepared a few weeks before, frozen and ready to be served with a white pork sauce. I had the chance to eat just one of my ravioli on the wedding day, because, as tradition wants, we spent more time around the tables chatting with friends and family than actually sitting down to eat. Of course, those 1,500 ravioli were probably too many, as we are still eating them. I met Emanuela more than 10 years ago on the forum of Il Cavoletto di Bruxelles. We have crossed each other’s path often, thanks to cooking classes and friends in common and, eventually, we became friends. Emanuela has been a pastry chef for just over a decade, but she has always been passionate about sweet things. She is known as La Dolce Peonia, the name of her laboratory which later became her own. Today she teaches pastry classes, she works with pastry shops and restaurants and she is often in Paris, for pleasure and for work. She was one of the first friends to know that we were getting married, a year in advance, as I could not imagine anyone better than her to make our wedding cake. After a round of emails and tastings, we came to the final decision on what would have been our cake: a dark chocolate biscuit, brushed with orange syrup (the one left after candying my orange peels), a filling of sheep ricotta with chocolate drops and, as a cover, a vanilla white chocolate ganache. 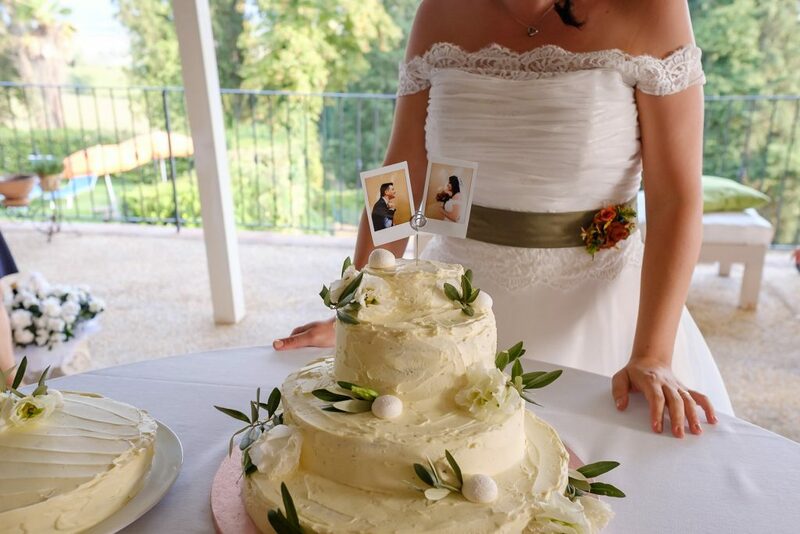 A cake that was not too sweet, light, something that everyone really liked: in the wedding video you can see my mum passing by and clearly telling us: mmmhh buona la torta! such a good cake! We froze a piece of the cake: we’re going to eat it next September 22nd, to celebrate our first anniversary. Emanuela also prepared a beautiful spread for the dessert buffet: small choux craquelin pastries filled with mascarpone chantilly and orange marmalade, coffee biscuits, zezettes, and small glasses of ricotta cheesecake, everything to be served with our homemade liqueurs: limoncello, nocino, bergamot liqueur and verbena liqueur. Our friends Sarka and Pavel made a surprise and made this video of the day: I do not know how many times we have already watched it, it shows perfectly how we felt and how much we enjoyed the day. I can’t believe 4 months have flown away since this glorious day! Everything was perfect, even the wedding bouquet moment! I’m not one to cry but cried all through the ceremony! You two are so perfect together! Love you guys! What a magical impression of a beautiful day! Heartwarming to see. And you were gorgeous Giulia! Auguro a tutti voi la felicità del mondo! Wow. The most romantic, lovely perfectly sweet wedding! I found your site during the Saveur awards and have been smitten and enchanted ever since. You write beautifully and despite English not being your first language, I am breathless at times with how clearly you Express yourself! 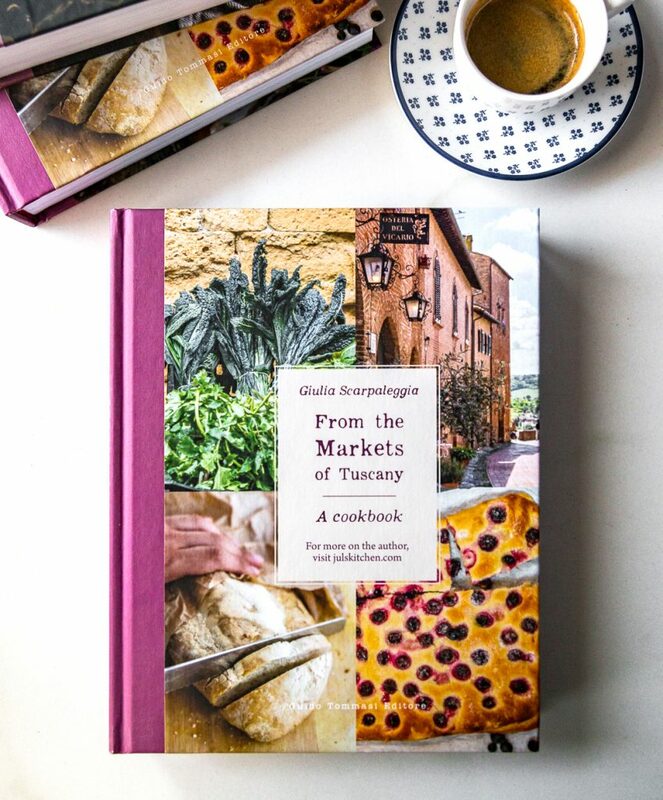 Reading about your romance and looking at the food you make while reading about the inspiration, the crafters, the farmers, the everything of Italy…wow. I cried when I watched your video and saw how absolutely in love the two of you are; the lead up to the wedding on your posts has been exciting. Bless your friends for creating a very touching video. I hope to visit you and take classes and immerse myself in all that my heart feels when looking at the pictures and reading about your lives there. I am a trained whole food, nutritionally focused chef. When I read about your menu, it made me cry even more. I currently live in rural Kentucky. It has the most tragically pathetic food system, is a food desert, is a food NOTHINGNESS, of any place I have ever lived. Seeing how Italians CHERISH, PROTECT AND LIVE their lives with saving traditional food ways is beyond awesome; I have been a slow food member since 2002. I get it. Even though I have grown up with the SAD, I have longed in my heart to be around people that understand the connections of their food and selves. Above all else, the Italians epitomize this in my mind. I have never been to Europe but Italy is my top destination, and your area in Tuscany is THE place I want to stay. Gratitude and love for all you share and may you and Tomasio have the most magical, kind, loving life together. How beautiful! your wedding really put a smile on my face, such a joyous celebration! Happiness to you both always. I have been following your adventures (cooking and otherwise) for years and regularly refer to your blog for recipes and inspiration. I get a huge smile on my face each time I see pictures of the two of you, thank you for sharing this joyous event. Your described the day so beautifully. Your words have transferred me back to the day and brought back tears to my eyes. I’m so happy and grateful that I could be there to celebrate this special day with you. You are the sweetest couple I know, made for each other, forever.